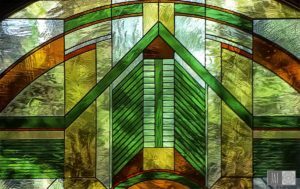 Stained glass design is a unique element in architectural design. Known for its radiant beauty and inspiration, the elegant freedom of art glass is paradoxically bound to form and structure. Architect Frank Lloyd Wright was one of the most accomplished and influential figures in stained glass design. 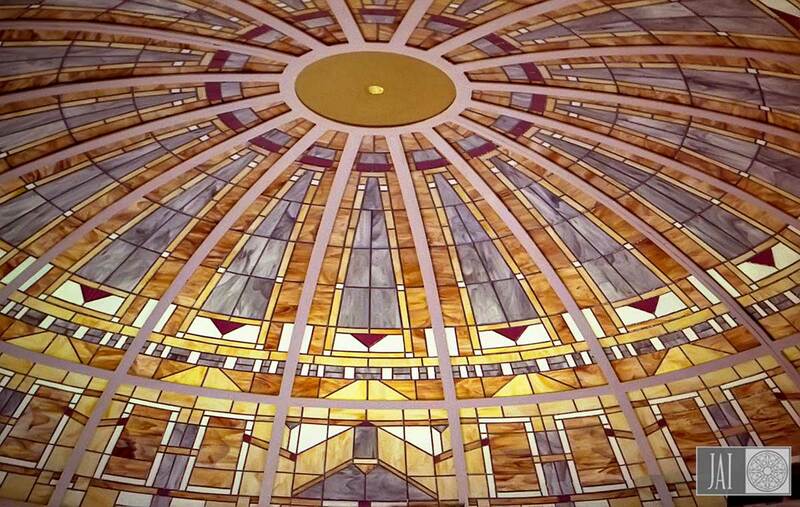 He understood the relationship between not only form and structure, but form and function, leading Wright to design stained glass skylights, backlit stained glass ceiling panels, art glass wall sconces, and leaded glass table lamps, all in his classic geometric style. All artists have their inspirations, and the team at Jancik Arts International is no different. Principal and chief designer Angelique Jackson cites Frank Lloyd Wright as a major influence in her career. Trained as a professional draftsperson, Angelique was inspired by Wright’s use of glass in his buildings, using what he called organic architecture, to seamlessly merge his art glass with its surroundings. This use of glass directed Angelique’s formal studies in architecture toward stained glass design and architectural accessories. 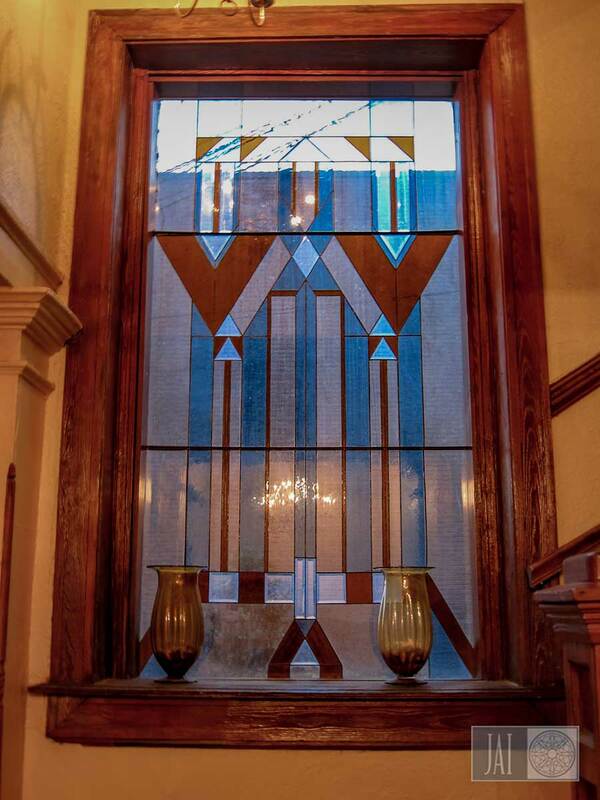 When interior designer Randy Schrader commissioned Jancik Arts to install stained glass windows in the stairwell of the historic Marion Block Opera House, he requested an optimum amount of natural light, but also wanted the stained glass windows to hide or disguise the adjacent brick building. In a nod to Wright’s organic architecture, rather than hide the color and rich texture of the brick next door, the Jancik Arts team decided to feature this element as an enhancement. Light sensitive German antique glass was selected in colors that complimented both the adjacent building and the Marion Block building that houses the work. This translucent type of glass afforded the much needed natural light, while the handsome Wright inspired geometric design complimented the overall structure in which the windows are housed. Sometimes the environment calls for a particular style of design. 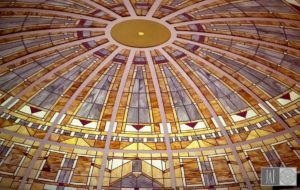 Sometimes the client simply says “Frank Lloyd Wright,” and their desire is clear, as was the case with this stained glass transom created for a private residence in Chappaqua, NY, or this beautiful 12-foot stained glass dome titled Exposition. 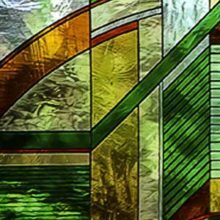 Whether it’s a stained glass window, a stained glass ceiling dome, or any art glass accessory in between, Jancik Arts International can create stained glass designs in any style, producing timeless beauty that will endure for generations to come.